Well, at least I had hope for about twenty-four hours. Remember yesterday's post about the ~$13 tickets to Europe on Ryanair (here)? Looks like its not actually happening. I was pretty disappointed when I read it in the Globe today, then I was reminded by Bloggery Reader Todd about it so I figured I better make a post. Do imminent $13 airfares between Boston and London sound too good to be true? That’s because they are. 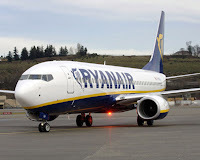 The initial story, which appeared Britain's News of the World tabloid on Sunday, quoted Ryanair chief executive Michael O'Leary on his plans for the carrier. The Associated Press picked up the report, which noted that Ryanair plans to offer flights as cheap as $12.70, before taxes. The problem is that Ryanair has been talking about its plans for new service to the United States for a quite a while, but officials at Logan International Airport say as far as they can tell the carrier isn’t close to launching flights. What a tease. But it does go to show how fast rumors can travel during the age of the internet and how easily the media will publish something. 0 Response to "Cheap Ryanair Tix = Wishful Thinking"